Survey shows nearly half of people charged with marijuana posession were not displaying the drug when they were stopped. Police officers in New York are “manufacturing” criminal offenses by forcing people with small amounts of marijuana to reveal their drugs, according to a survey by public defenders. Nearly half of New Yorkers picked up for small amounts of marijuana possession in recent months were not displaying the drug before they were stopped, the study shows, despite an order by New York police chief Ray Kelly that officers should not charge people in such circumstances. 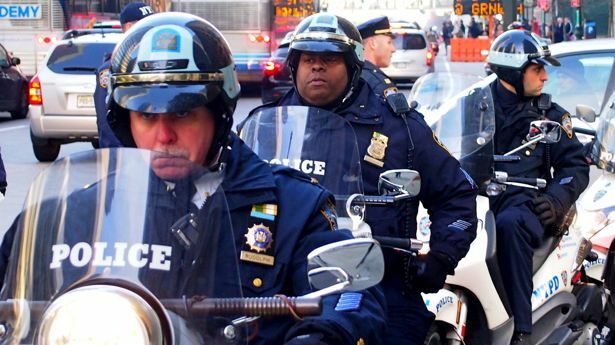 The revelations will fuel criticisms of the NYPD’s controversial “stop and frisk” policy, which opponents say is criminalising a generation of young people from ethnic minorities and leading to tensions between police and the public. No big surprise. When you have a rogue agency disguised under the color of law, enforced by drones with guns and badges who's pay checks depend on not knowing or paying any attention to any truth of justice or due process all pumped up and addicted to adrenalin rushes and power, this is what you get. As it has been stated, "We will get the regime we deserve."